You may remember last July I wrote about the iPhone App launched by Absolut: Absolut Drinkspiration. The post got a huge amount of traffic and I thought you might be interested in an update of the campaign. Drinkspiration version 2.0 is now available for download and it features a host of updates including even more drinks based on mood, time of day, bar vibe, drink colour, etc. 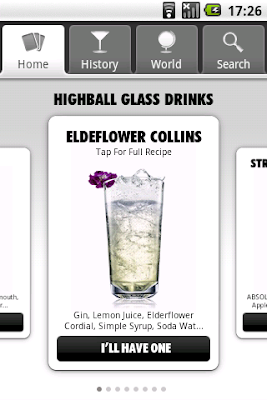 However, this time around Absolut has also launched an Android version of Drinkspiration for non-iPhone folk. A sophisticated drink application combining the latest mobile technology with GPS, Twitter and Facebook. Drinkspiration by Absolut is an interactive encyclopaedia of recipes, that helps you find and share personalized drink recommendations based on taste, weather, time of day, bar vibe, sound volume, real-time drink trends and much more. The application gives you a glimpse of the international nightlife scene, allowing you to see what drinks are ordered in real time across the globe and highlights in global drink trends and top lists – all made possible by GPS technology. Looks like an amazing application and of course great post! As a matter of interest could you tell me which agency actually created the app for Absolut?? Hey Kevin, this campaign and app was created by Great Works (www.GreatWorks.com) at their New York office. If you wanted more info I can pass you on contact details for the guys I know there.